Located north-east of the heart of Tokyo, Ueno has been a perfect destination for those who desire good food and cultural exploration. What makes Ueno distinctively unique is its dynamic blend of contrasts; chaos and serenity, urban development and natural beauty, modernity and tradition, common touch and nobility. Ueno Park is located on what was once the grounds of the largest, most prestigious temple in Edo (old Tokyo), from the the 17th to 19th century. It is one of the most beloved cherry-blossom viewing spots in Tokyo. Local Japanese and tourists flock together for shopping and eating at its nearby district Ameyoko, where you will find a countless number of unique bars and dining places. While tasting the foods and enjoying the atmosphere of the area, you will find yourself becoming welcomed as a local in this friendly community. 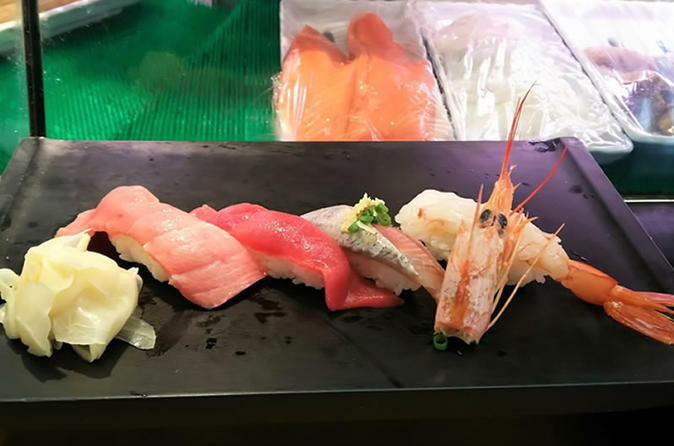 From our Secret Food Tours in Tokyo, you will get to savor many different types of culinary delights, that showcase locals' most loved foods. 3 to 3 ½ hours guided food tour with 9 stops and 6 tastings. A passionate and experienced local english speaking guide. Small groups with maximum of 10 people. Experience the history of the city, its food, the culture and leave with a satisfied mind and body. A traditional styled Japanese lunch (Our secret dish) with seasonal flavors, a desert included - all beautifully mysterious to your eyes and mouth! Yakitori, skewered chicken - perfect match with beer!